To say that Oliver Perez had a difficult 2009 season would be an understatement. Good thing for Ollie he married his wife prior to spring training, or the year could’ve been a total loss. Perez spent most of the season on the disabled list, and pitched poorly during those brief stints off of it. his season-long malaise began before Opening Day, when he supposedly allowed himself to get out of shape during the World Baseball Classic and in turn was lambasted by both Dan Warthen and Johan Santana. From there on, it was all downhill. Ollie spun one decent game — a 6-inning, 3-hit outing vs. the offensively challenged Padres — out of his first five starts before going on the DL. Though he was among the first of the “cavalry” to go down, most fans saw his knee injury as a blessing, as he was unable to pitch past the fourth inning in any of his other starts. Perez didn’t make another start until July 8th, and was at best mediocre in 9 starts before undergoing season-ending surgery. We could surmise that his knee never healed, and it was the cause of his poor pitching performances. In a perfect world, the surgery and successful rehab this winter will lead to Oliver Perez returning to the form that made him a 15-game winner in 2007. Unfortunately, it’s hard to say ALL of his problems can be solved that easily. For one, we can assume that a painful knee would have caused Perez to alter his mechanics — which in turn resulted in lack of command and a dip in velocity. 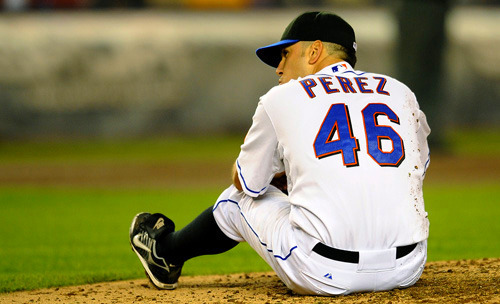 So in addition to getting healthy, Perez will also have to re-discover the mechanics that made him a dominating pitcher. You know the problem with that: no one is sure WHICH style best suits him. Going back to his days in Pittsburgh (and San Diego), Ollie’s biggest issue has been an inability to repeat his pitching motion. He has too many moving parts that have been changed too many times, to the point where he’s not even sure what’s “right”. During the 2008 season, the media lauded Dan Warthen for “fixing” Oliver Perez after Perez posted a 1.38 ERA through five starts in July and followed that up with another 4 (out of 6) strong starts in August. But the spin doctors didn’t explain Ollie’s disappointing September, and conveniently forgot that his best season came in 2007 under Rick Peterson. Personally, I don’t know that either pitching coach had a magic touch, or if Perez simply responded to a change in the messenger (in both cases). Maybe after hearing someone for too long a time, Ollie loses focus, or stops listening. Or maybe he needs someone to constantly provide direction. One thing we can all agree upon: Oliver Perez is an enigma. He has displayed an awesome arsenal of tools that can dominate hitters for long stretches — to the point where he could have been considered among the top 5 lefthanders in the NL in 2007. But he’s been just as awful for equally long stretches. Which Ollie will show up in 2010? Your guess is as good as mine. Back Can the Mets Use a Mental Coach? I think Perez’s initial 2008 success was do to the ability to be himself, as it was credited to Warthen. Which is fine, I actually do think it was a good idea, but Warthen didn’t provide the oversight and the initial boost Perez got by being able to throw a different pitch, and experiment with different arm angles (something Rick chewed him out for) was negated when people started figuring that out and Perez didn’t know what to do with it. couple that with Perez’s statement that he doesn’t think walks are a bad thing. That he could ever be allowed to voice that suggests both a disconnect with Warthen(who supposedly started fining pitchers for walks or something?) and a lack of a solid gameplan. He’s right in the sense that if he’s going to give up walks, and then get the next guy, that’s fine. walks aren’t the end of the world if you’re pitching well, but he has to know when to differentiate between being able to get the next guy, and when he’s struggling enough that he should go after guys and take his chances. Perez is definitely a head-case guy, and needs guidance. You can spout maturity and “he should be able to do this” type stuff all you want, but it boils down to he needs oversight. He should never have been allowed to go down to Mexico alone, all willy nilly, and do whatever he wanted. He should’ve had a trainer with him, and the Mets should’ve worked with that trainer, and Mexico, to make sure he pitched when he needed to on the side and did his normal routine as if it were spring. I’m really worried that Warthen is a disaster as a pitching coach, specifically with Perez. I’m starting to wonder if the best move the Mets could make this offseason is bringing in a catcher that can get on Perez in-game and keep him on task, and on target. Ceetar – all good points. I agree with every one of them, and particularly with the oversight factor. He may not necessarily need a pitching coach with a “hands on” style, but he certainly seems to need a pitching coach who is willing to be more “hands on” with him specifically. Thus far, it appears that Warthen will not be that guy. Agree Warthen is not the guy for Perez. Inthe earlier post it was stated that Warthen is not the guy for Pelfrey. If Warthen is the disaster most here agree he is, then how can the Mets contend with a pitching staff that will be in disarray again next year? Afterall, Minaya isn’t going to find 4 new aces to bring in. Oliver Perez should have never been resigned last year. When they were talking about $30 mil for a pitcher that gave up 5 games a year was a problem. The guy needs to be taught gimicks to keep him focused on pitching. I knew when the Mutts gave him $36 mil it was going to be a disaster. When you give a player that much money they have to be mature focused and they have to be able to make adjustments in game that prevent bad outtings from becoming disasters. The Mets gave up another 2 draft picks by not letting Perez walk although they would have screwed that up considering they are as cheap as Marge Schott when it comes to signing draft picks. We’re stuck with Ollie for the next 2 yrs so we have to make the best of it and hope for the best. What’s a realistic upside projection? Pretty good actually. Of course thats the upside projection not the most likely. But the Mets have to try to make that happen. The guy has talent and he’s been good before. Also, don’t understate the effect that pitching hurt had on him. Because Ollie’s a sensitive guy who often gets nervous and flustered out there everyone seems inclined to attribute all of his problems to mental causes. Well he’s also a physical being like any pitcher and he can’t be as good when his body is damaged. If he is healthy next year I won’t be surprised if he is very good, say 3.30 – 3.70 ERA good.